It’s something I think we’re all guilty of from time to time, but it’s also something that’s hard to avoid. We overthink things. It’s not necessarily a bad thing, there’s certainly no harm to it, but I do find that it can become difficult to see the wood from the trees when you get deep into a project. On some occasions you find that you’ve moved so far away from the path that you wanted to follow, that you’ve lost the enjoyment that should have come with it. When you realise that, it’s a pretty sobering moment. 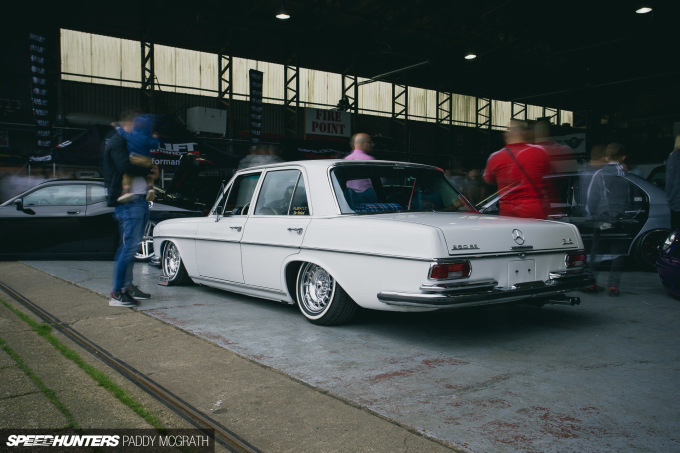 What I love about Marcel Bäumer’s 1972 W108 Mercedes-Benz 280SE is that its simplicity and purity is what made it stand out in a sea of genuinely incredible builds at the recent Players Show 10 in the UK. For me, this was arguably the car of the show. 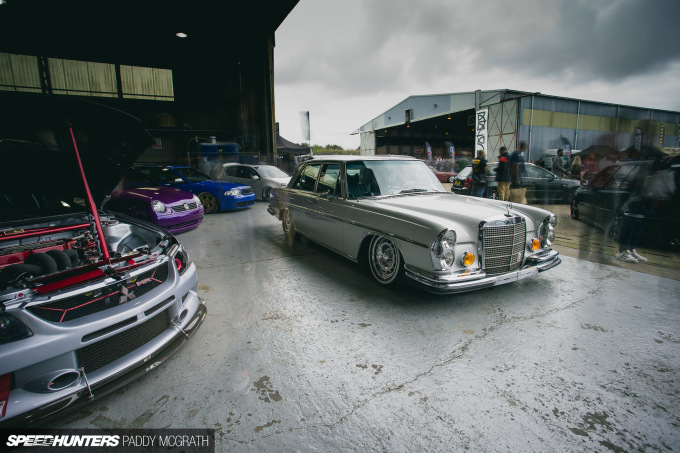 Sat front and centre in the smaller hangar at Players, Marcel’s W108 was the jewel in a crown of a collection of very impressive show car builds. 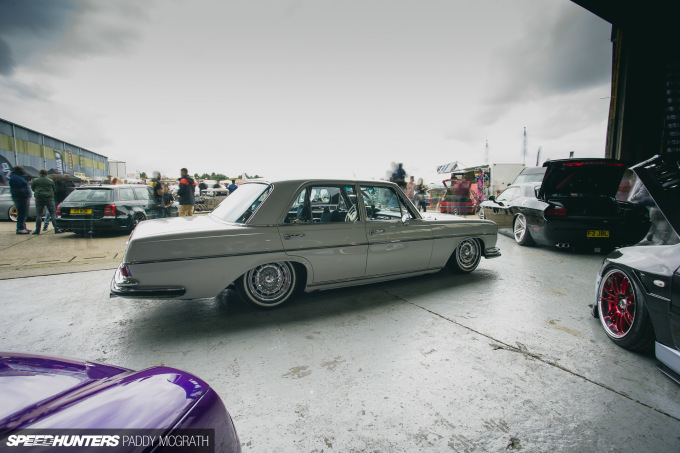 Flanked by far more contemporary builds, including a Dodge Challenger, a Lancer Evolution and a pair of Volkswagens, the vintage Mercedes just felt like the matured and respectable build amongst the others. It would certainly have been the gentleman’s choice. 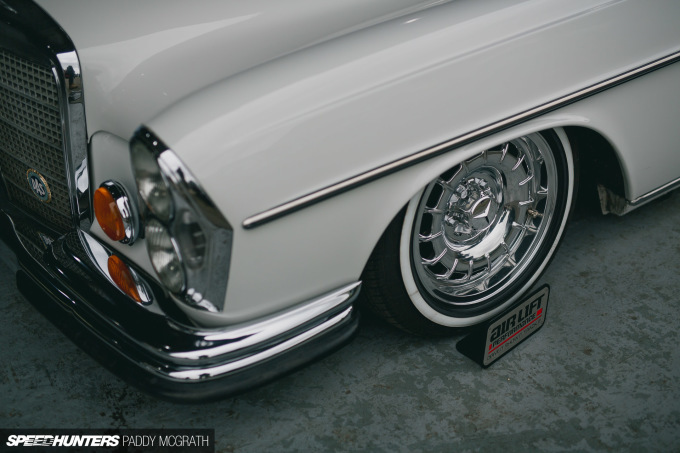 Marcel bought the car back in 2014 and spent the next two years restoring it to its new glory. Originally a French car, it spent some of its life in the Netherlands before ultimately ending up in Germany and being taken apart. On the surface, it appears to be a very simple build, but a lot of work and consideration has gone into it. Simple doesn’t always mean easy, I guess. The finished car does tell you that Marcel had a plan and stuck to it religiously, though. 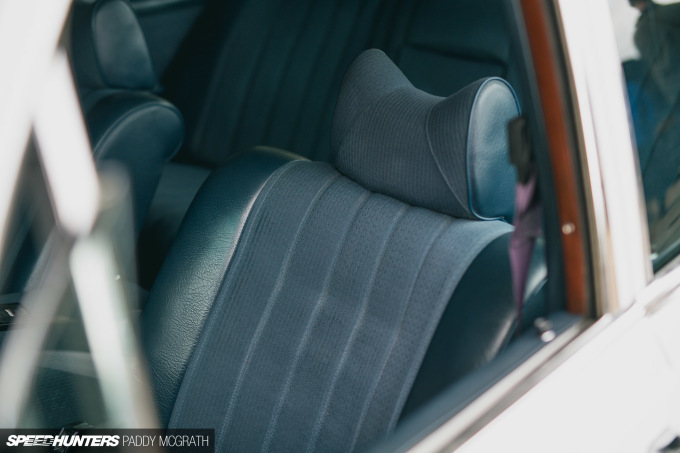 A custom air suspension solution utilises Air Lift Performance bags with 3P management, although he plans to upgrade to 3H over the coming winter. 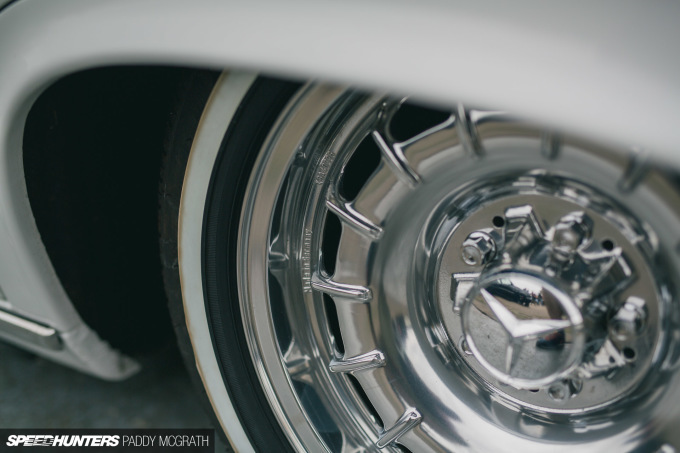 The period-correct, yet quite rare in this size it appears, original 15×7-inch Mercedes Barock wheels have been ceramic polished and wrapped with 205/55R15 tyres. The white-walls work exceptionally well with the pearl white body colour. 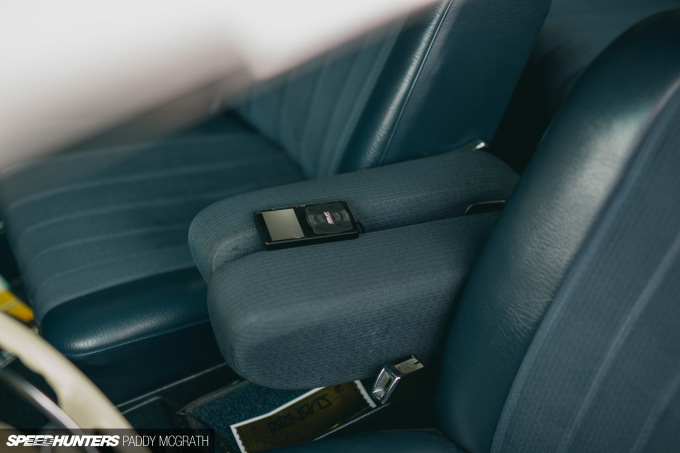 The car also features some interesting optional extras from new, including four headrests, air conditioning, window tint, twin front armrests, an automatic radio antenna and rear seat belts. The exterior modifications are subtle too, with US-spec rear lights and turning lights at the front. 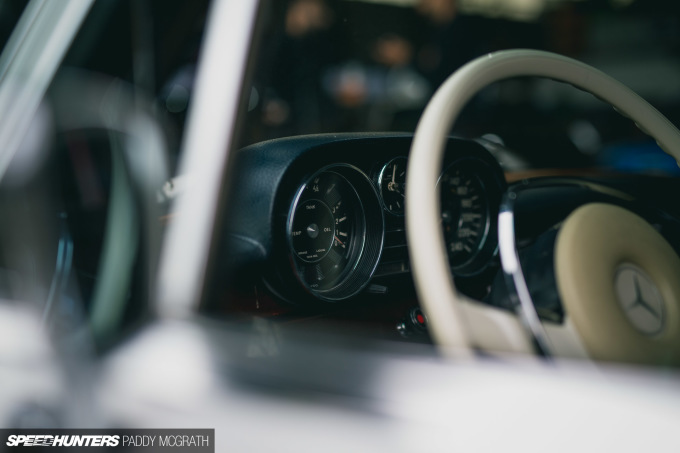 The interior has been completely reworked from how it left the factory, with the seat coverings and carpets being recoloured, the wooden interior trim being completely refurbished and an ivory white steering wheel and shifter installed too. The original Becker Europe radio has been adapted to work with a modern speaker system and is also MP3 compatible. When you stand back and look at it, you can’t but help imagine yourself cruising on a summer’s day without a care in the world. 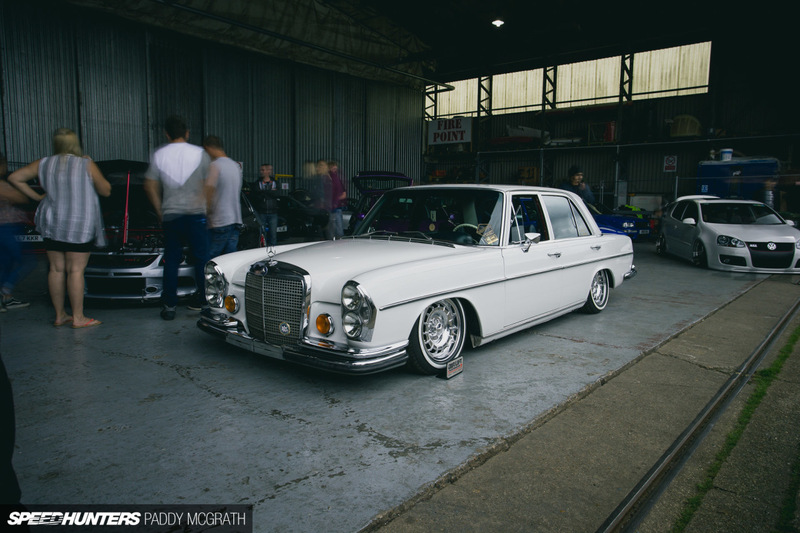 It’s also one of those rare cars that would be welcome at pretty much any type of show. 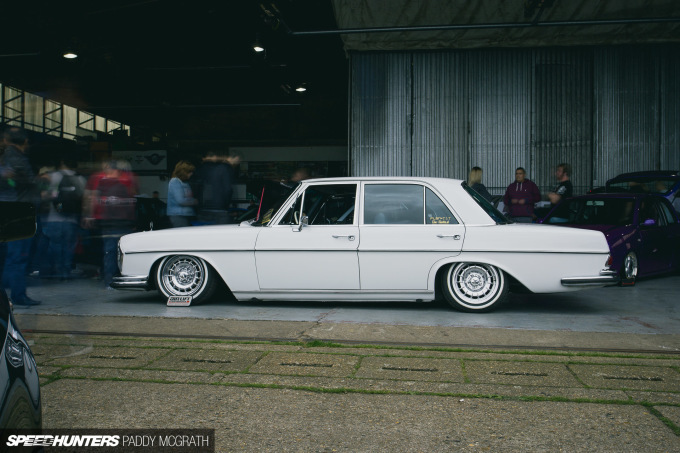 It’s vintage, it’s modified, it’s low and it’s classy. 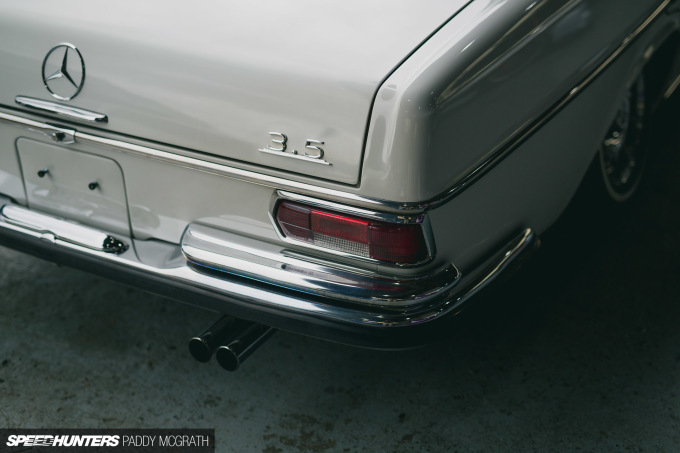 It was always Marcel’s intention to keep the 280SE as close to original styling – and the ground – as possible. There are no crazy ideas here, nor is there a wild engine swap. It’s just a simple idea that’s well executed. We can all learn a thing or two from this. 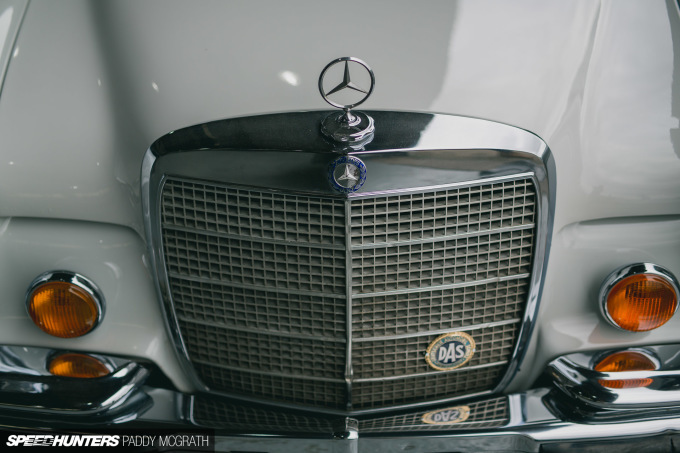 "Cars Don’t Have To Be Complicated"
So, you've never tried to work on a Mercedes. They are the very definition of needlessly complicated for absolutely no reason or benefit. It is as if the designer wanted to make a car whose assembly and disassembly steps embodied the cryptic hints in an Indiana Jones movie, just to screw with the people unfortunate enough to be asked to repair it. It helps when you start with a good car. 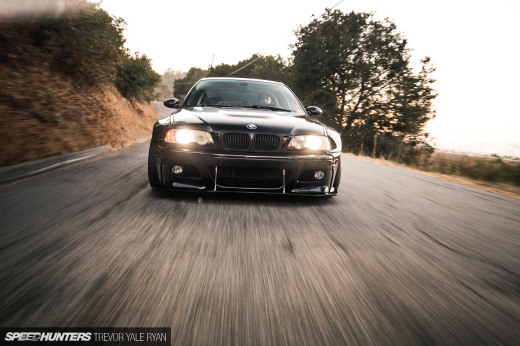 And yes I want a giant slammed German sled. 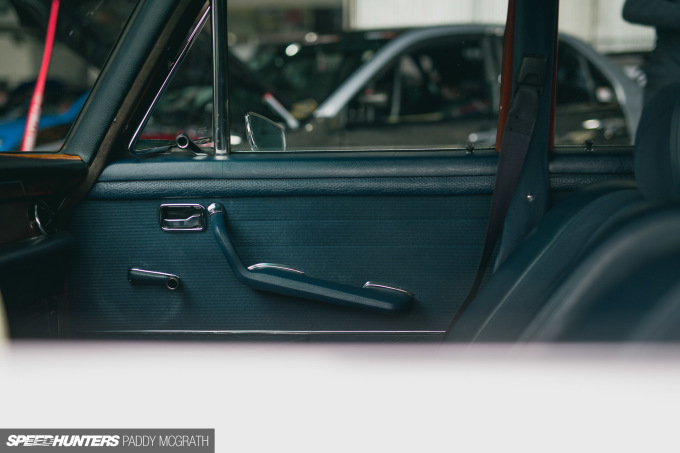 @Guest I think what Paddy is taking about is the amount of modification you choose to do on a car. Not about how complicated/uncomplicated this specific model is. Effortless cool, which takes a surprising amount of effort to pull off. I love this. Not just mercs. Lots of (esp. German) cars define over-engineering. rook56 I still don't think that is what Paddy is talking about. rook56 Over engineering isn't a bad thing, but also completely not the point I was making. gahopod tell us more about this amazing offer!! @Guest maybe you are just a horrible mechanic and everything is difficult for you. every car is easy to work on if you know what you are doing. maybe you will get there someday. I completely understand and agree with your original point. Subtle often works best. This car certainly shows that. I also agree with Guest's different point. I don't like over engineering when it creates more points of failure. My Uncle Alex just got an awesome year old Toyota from only workin part time on a pc at home. 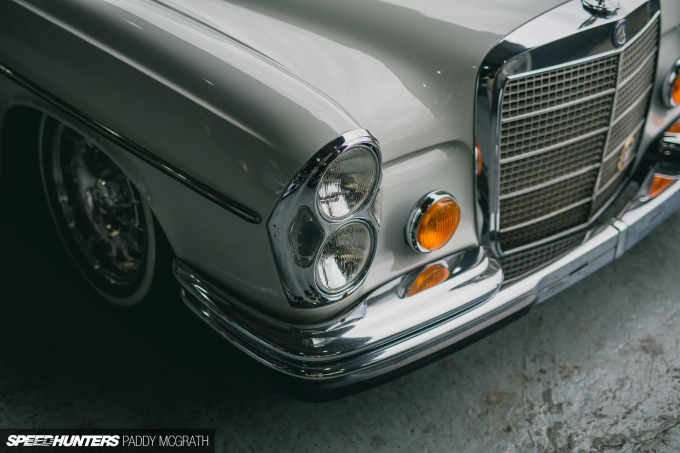 It sounds like you haven't worked on a W108. I happen to own one and it's as far from complicated or overengeneered. It's an absolute reliable German tank. 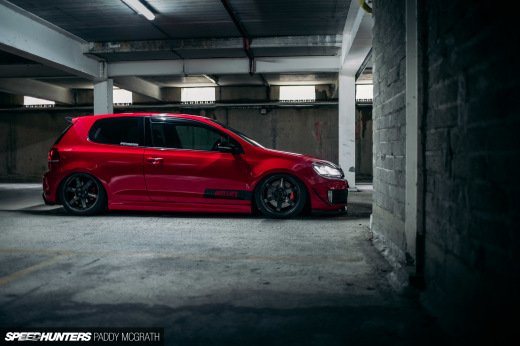 So as much as it seems that's not what Paddy was talking about, I think this car is elegantly simple on all fronts. 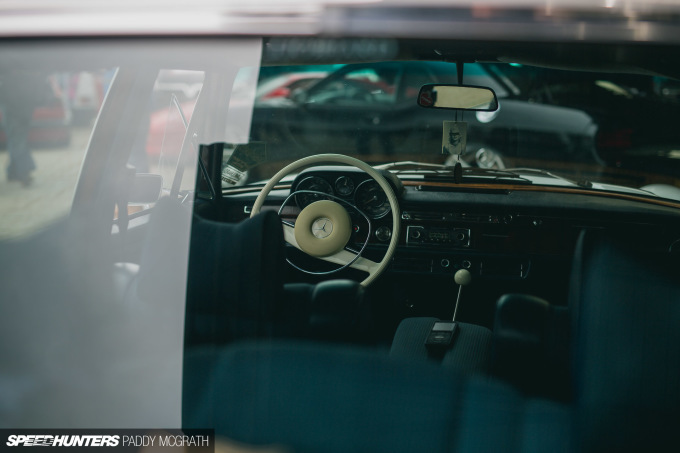 Thank you Paddy for featuring such a clean and simple build, a sadly rare thing these days. my Aunty Kate got red Cadillac SRX only from working part time off a home computer. GeoffreyCaruana my Aunty Kate got red Cadillac SRX only from working part time off a home computer. 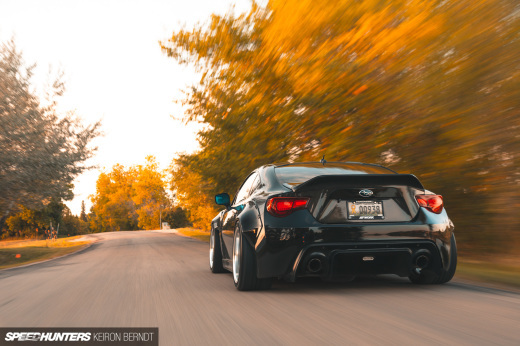 Was this on wheel whores project page.